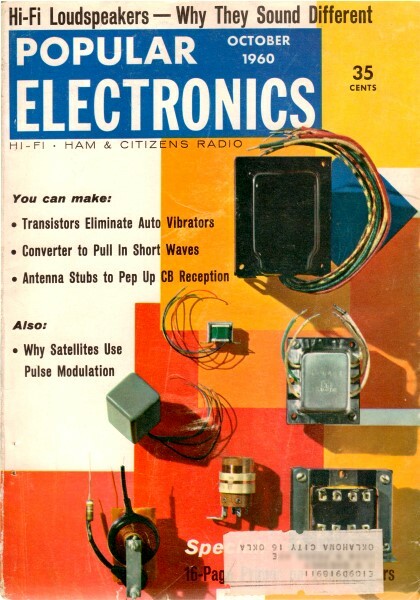 A while back I was taken to task for remarking on the seemingly crude (I think the word I used was 'barbaric") nature of some early medical machinery that appeared in a mid-20th-century edition of Popular Electronics (see "Electronics Against Cancer"). I won't repeat my mistake here when describing how early medical x-ray machines are scary looking. Admittedly, being stuffed inside a modern MRI machine and having the loud electromagnetic coils cycling is no relaxing trip to the countryside, but the x-ray machine shown here looks like the Q-36 space modulator beam Marvin the Martian might have pointed at the Earth to disintegrate it just before he asks, "Where's the kaboom?" The anxiety caused by the behemoth's presence could not have given much comfort to the poor souls being treated. Seriously, though, there is a lot of good info about the evolution of lasers in this article. Not in any known form. With such scientific frankness did physics professor Wilhelm Konrad Roentgen relate his discovery of a mysterious new ray to a newspaper reporter. 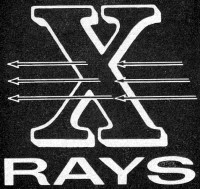 Stumbled upon by accident during a routine laboratory experiment on the night of November 8, 1895, the new ray was dubbed an "X ray" by Roentgen. "X," then as now, was the mathematical symbol for the unknown. Much of the "X" has been taken out of X rays since the modest German physics professor demonstrated this startling radiation and its power to penetrate tin, paper, wood, and even the human body. 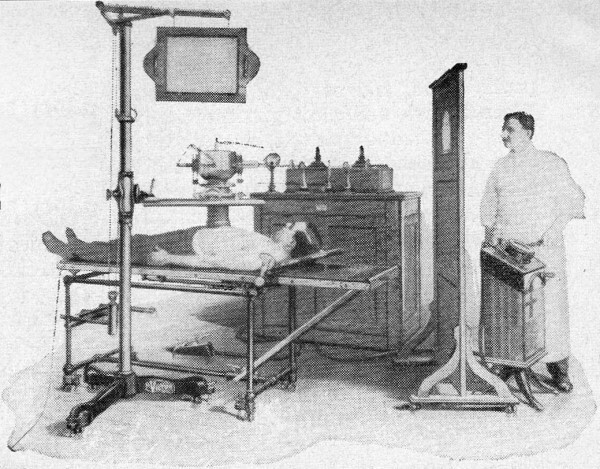 When X-rays were first put into use, you ordinarily had to visit a hospital to see them in action. Today, unlimited industrial applications make X rays far more than just a diagnostic and therapeutic tool of medical science. Chance - or Fate? Just what did happen on the night of November 8, 1895? Call it fate, fortune, or chance, but there were a number of conditions that conspired to make this night one to remember. First, Roentgen had completely covered the Crookes tube he was using with a black cardboard, making it light-tight. Secondly, his laboratory itself was plunged in darkness. Finally, the piece de resistance - a sheet of paper painted with crystals of barium platinocyanide - lay on a bench some distance from the tube. The barium platinocyanide screen was the "chance" that nature gave Roentgen to unlock one of her secrets. For when the crystals glowed with a shimmering yellow-green fluorescence, Roentgen's keen scientific mind became curious. True, cathode rays could make the crystals glow - but at this distance? He placed the crystal screen at an even greater distance from the tube than the range cathode rays were known to penetrate. Still the strange fluorescence! Heart pounding, he grabbed a book and placed it between the Crookes tube and the screen. The crystals continued to glow. Whatever it was, it was coming through the book! Next, he tried metals - and found that the rays penetrated in varying degrees, although lead and platinum stopped them completely. Now came the most dramatic test of all. Roentgen exposed his hand, and - his heart must have almost stopped - saw the shadows of his bones. As Roentgen made photographs of his findings, it was obvious that he had found something far more exciting than cathode rays - X rays! How X Rays Are Formed. How was Roentgen able to produce these powerful rays with his crude apparatus - a modified Crookes tube, mercury interrupter, and a Ruhrnkorff induction coil that furnished a bare 20,000 volts? The simple fact is this: X rays are relatively easy to generate. You simply speed up electrons and let them collide with a target. The electrons cause disturbances within the atoms of the target, releasing X rays. Any material, even a gas or liquid, will release X rays when bombarded by high-velocity electrons. Obviously, then, glass can be a target, as is was in the Crookes tube Roentgen used - see Fig. 1. Here a gas-type tube, consisting of an anode and cold cathode, was connected to a high-tension induction coil. Heavy positive ions in the residual gas were drawn to the negative cathode (unlike charges attract), striking with such force that they knocked electrons from the cathode metal. It was this positive-ion bombardment that created and maintained a source of electrons, the "work horses" for X-ray generation. The negatively charged electrons, in turn, were drawn toward the high-voltage positive anode. The resultant stream of electrons, actually cathode rays, traveled so fast - about 30,000 miles per second - that most of them could not "turn the corner" to reach the anode. Instead, they smashed into the glass wall of the tube. The glass, therefore, was the target, providing the barrier for the sudden stoppage of electrons. The result: radiation of X rays, and, of course, the glow of fluorescence of the glass that Roentgen observed. Fig. 1. - Crookes tube used by Roentgen produced X rays when electrons flowing from its cathode to its anode bombarded the glass tube. Fig. 2. - Basic X-ray unit includes X-ray tube and high-voltage supply. Fig. 3. - X-ray tube detail. The focusing cup concentrates electron stream from cathode and directs it toward tungsten target material. Nature of X Rays. X rays are electromagnetic rays similar to visible light rays, with this important exception - their wavelength is very small, about 1/10,000th that of light. These tiny wavelengths are measured in angstroms, units so small that you can line up 254,000,000 of them between the one-inch marks on a ruler. The X-ray region in the electromagnetic spectrum ranges from about 0.006 to 1000 angstrom units. Interestingly enough, it is this exceedingly short wavelength of X rays that makes possible their penetration of matter, and which enables the researcher to delve into the vast voids of molecular inner space. Unlike the cathode ray generated in your TV picture tube, X rays are non-electrical. Thus, they are unaffected by electrostatic and magnetic fields. This can be proved by placing a magnet or charged plate near X rays; they "ill be neither attracted nor repelled as in the case of cathode rays. The darkening of photographic film by X rays has given them wide application in medicine, research, and industry. A radiograph used by makers of cast-metal products is actually a shadow picture of the subject. The dark regions of the film represent the more penetrable parts - gas pockets in a weld, for example; the lighter regions identify the more opaque areas. How X Rays Work. 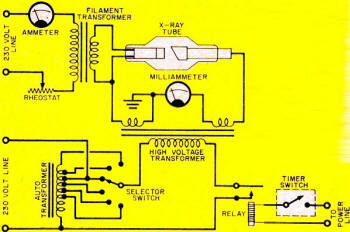 A basic X-ray unit is comprised of filament, high-voltage transformer and timing circuits - see Fig. 2. 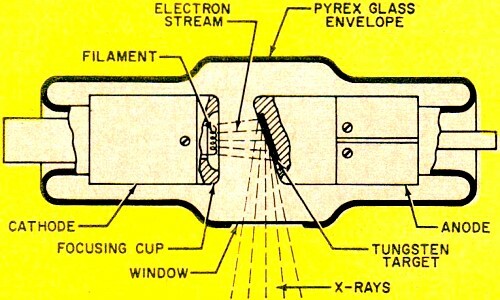 The heart of the unit is the X-ray tube. Like Roentgen's original tube, the modern tube also has a cathode and an anode, but with tremendous improvements. Now the tube is evacuated to an extremely high vacuum. The cathode structure contains a coil of tungsten wire - the filament - which "boils off" electrons when heated to incandescence. 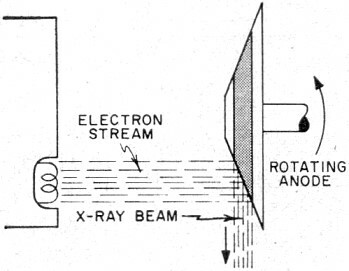 A metal reflector or focusing cup on the cathode directs the electron beam toward the target-as shown in Fig. 3. Tungsten is ordinarily used for the target material, since it can withstand high temperatures without melting. This is important because less than 1% of the energy in the electrons is converted to X rays upon bombardment with the target; most of the energy is converted to heat. To help dissipate the heat, the tungsten is imbedded in a large mass of copper which conducts the heat into air or into oil, as in the case of the oil-immersed tube. It is desirable to have the focal spot - the area of the target that receives the electron bombardment - as small as possible. The smaller the focal spot, the better the detail of the radiograph. But a small focal spot means an intense blast of electrons in a tiny area; even tungsten melts under such grueling treatment. This problem can be solved by simply rotating the anode target. The target constantly turns another "face" to the electron stream, area - see Fig. 4. An induction motor provides the rotating power in an ingenious way. The stator surrounds the outside of the evacuated glass bulb tube and provides the rotating magnetic field that turns the rotor in the tube at approximately 3000 rpm. The rotor in the "neck" of the tube is, of course, connected to the target. The entire moving assembly is located inside the evacuated tube. The high-voltage circuit consists of a step-up transformer and its controls; an autotransformer supplies voltage to the primary winding of the high-voltage transformer. Any change of the autotransformer voltage produces a corresponding change in the high-voltage output which is applied to the X-ray tube. Changes in voltage are made with a selector switch; increasing the tube voltage results in a decrease in wavelengths of X rays, accompanied by an increase in penetrability. Fig. 4. - Rotating anode in target constantly turns new face to electron stream in order to distribute heat over a wide area. Fig. 5. 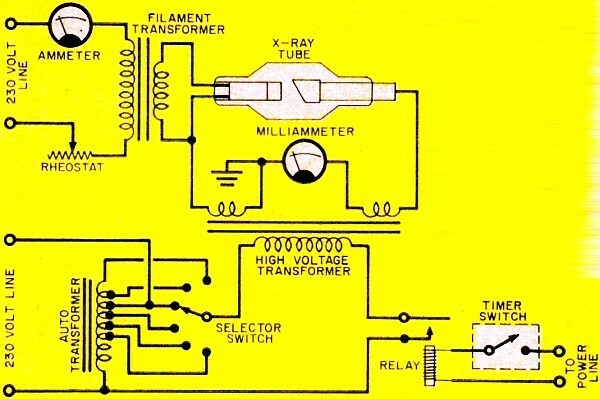 - High-voltage rectifier circuit used in some X-ray systems. If "soft" X rays of low penetrability and longer wavelengths are desired, the selector switch is set at about 20,000 volts. But if "hard" X rays of high penetrability and shorter wavelengths are desired, the switch is set for several hundred thousand volts. Rectification of the high-tension alternating current to the tube can be very simple - in fact, the circuit can be made self-rectifying. Current will flow through the tube only on the half cycle when the anode is on its negative half cycle, since the anode now repels the negative electrons. 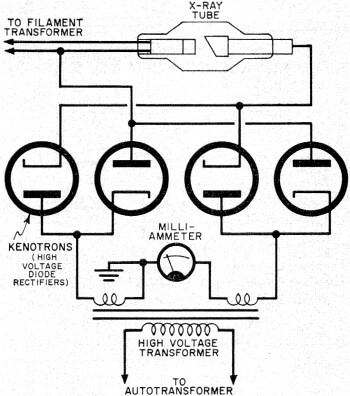 Some X-ray systems use a high-voltage full-wave rectifier circuit, permitting conduction of current through the tube on each half cycle of alternating current-see Fig. 5. Present Day Uses. Quality control in manufacturing makes extensive use of the non-destructive quality of X rays in the inspection of casting and weldments for such defects as cracks and gas pockets. X-ray devices in beverage plants "look into" opaque cans moving rapidly on a conveyor line and give the signal for automatic rejection of under-filled cans. Similar devices reveal foreign bodies in food stuffs; detect the hollow heart of potatoes; separate pithy from juicy oranges; and reveal the improper assembly of electronic tubes, switches, and small electrical assemblies. X rays also gauge the thickness of electroplating, as well as that of hot steel strip racing along at 4000 feet per minute in a rolling mill. Dramatic applications abound in X-ray diffraction. Here, X rays are made to bounce off mirror-like atomic planes of crystalline substances to reveal secrets of inner structure. Nylon, magnetic TV tape. synthetic rubber, high-temperature alloys, high-test gasolines, and penicillin are just a few of the products X-ray diffraction has helped to develop or improve. Art museums use X rays to examine the authenticity of old paintings. In other applications, X rays distinguish real diamonds and pearls from their imitations. Biologically Speaking. It is now well known that X rays as well as gamma rays can mutate or change the genes (hereditary units) of our bodies. Excessive X-radiation can also affect flesh, bone, and blood destructively. For these reasons, it is of utmost importance that exposure to radiation be kept at a minimum. What can be done in this respect? So far as background radiation is concerned, even Adam and Eve had to contend with the small amount of gamma radiation from radioactive material which occurs naturally in soil, rocks, and even plants. In fact, there are radioelements in our bodies that give each of us a daily unavoidable radiation dose of 0.0001 roentgen. (The roentgen is the unit of X- and gamma-ray dose.) In addition, cosmic rays from interstellar space add to our daily dose of background radiation. 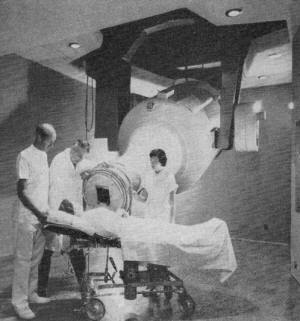 In essence, X rays are simply a form of man-made radiation, but new techniques and advancements greatly reduce the effects of their exposure to patients. Diagnostic voltages now up to 150 kv. permit much shorter exposure times, as do faster films. Significant, too, are collimators that confine the X-ray beam to the exact area desired. All in all, few would deny that the tremendous diagnostic and therapeutic benefits of X rays far outweigh any possible deleterious effects. In fact, many a man, woman, and child is alive today because of Roentgen's startling discovery. Since that eventful night in 1895, these once strange and unknown rays have done much to alter the nature of the world we live in.